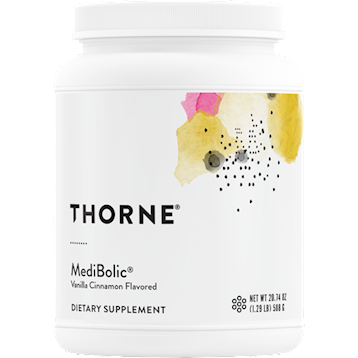 MediBolic is a good tasting rice and pea protein powder dietary supplement with the addition of soluble fiber, a complete multiple vitamin-mineral complex, and targeted botanicals and nutrients. This product is excellent for those wanting to minimize the number of pills they have to swallow. SunFiber® A water-soluble, partially hydrolyzed guar gum fiber, providing 9 grams of soluble fiber per serving of MediBolic. Guar gum has been shown to aid satiety and improve the glycemic effect of a meal. * SunFiber is easily digestible with none of the gas and bloating often experienced with a high-fiber supplement. Green tea phytosome Another Indena innovation, containing decaffeinated green tea extract bound to phosphatidylcholine for enhanced absorption. DIRECTIONS: Mix 2 level scoops once daily or 1 scoop twice daily with 12-14 oz. of water or preferred beverage or as recommended by your health-care practitioner. Other Ingredients: Vanilla Cinnamon,Gluten-Free,Dairy-Free, Sunflower Oil, Cocoa Powder, Stevia extract (leaf) (Rebaudioside A 97%).